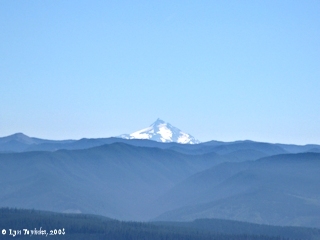 Click image to enlarge Mount Jefferson, Oregon, from Larch Mountain, Oregon. Image taken August 3, 2008. 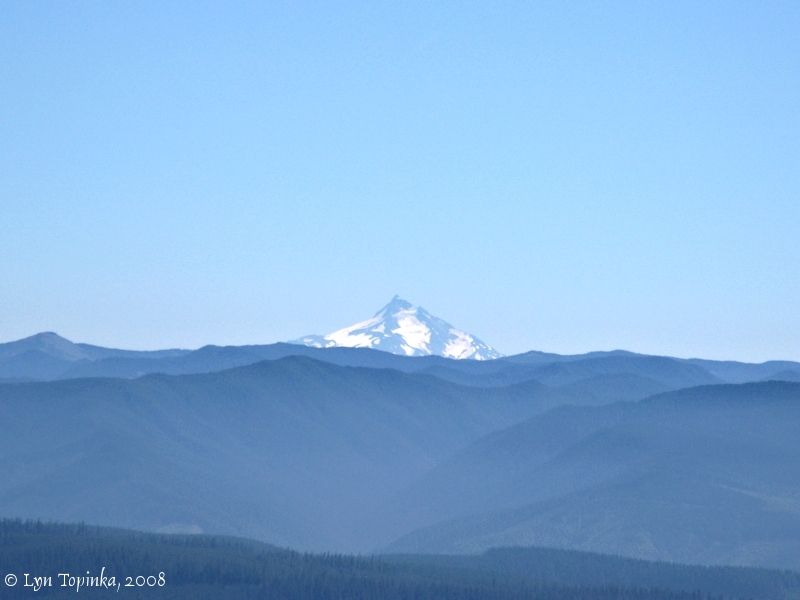 Mount Jefferson, at 10,495 feet, is the second tallest peak in Oregon, with Mount Hood being the tallest. Mount Jefferson is a stratovolcano which has erupted repeatedly for hundreds of thousands of years, with its last eruptive episode during the last major glaciation which ended 15,000 years ago. 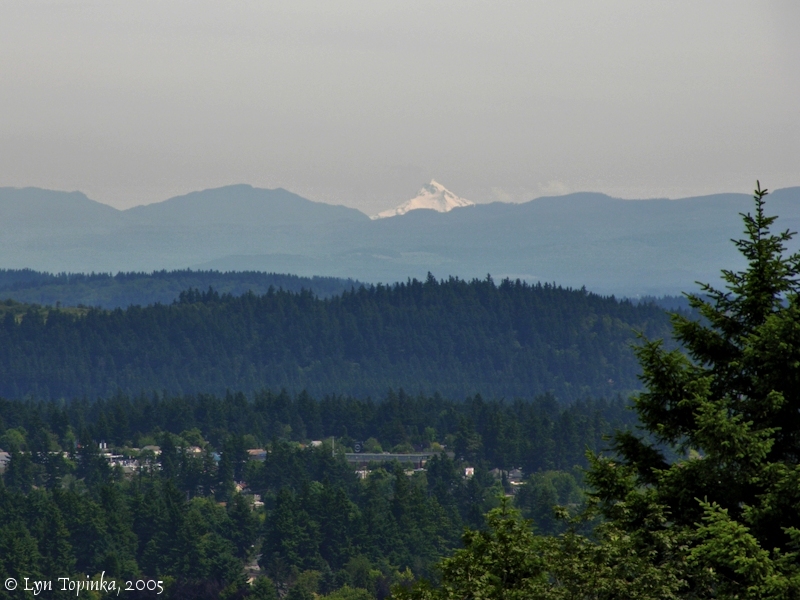 On March 30, 1806, Lewis and Clark gave Mount Jefferson its name. 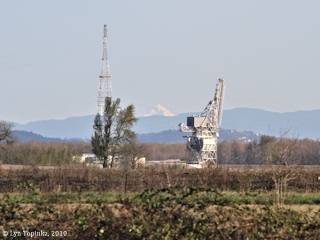 Click image to enlarge Mount Jefferson, Oregon, as seen from across the Columbia River, at Ryan Point. 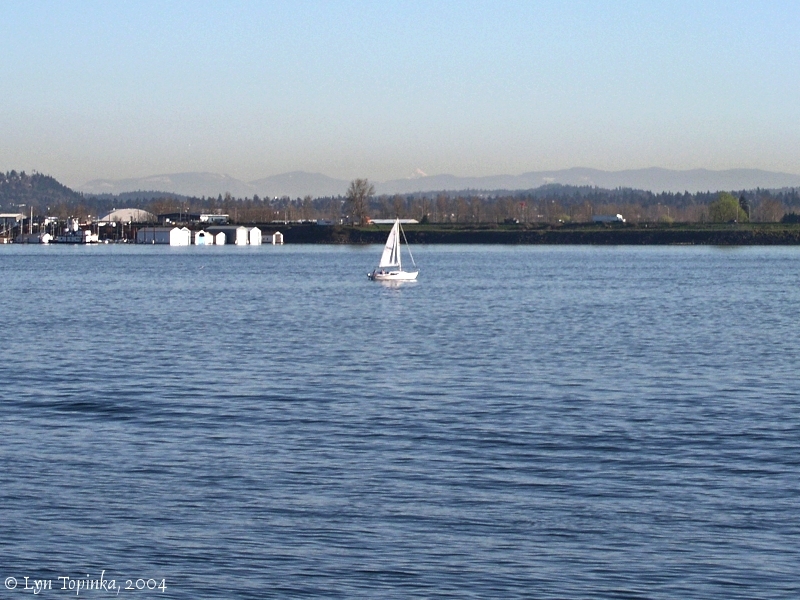 It was along this stretch of the Columbia where Lewis and Clark spotted Mount Jefferson. Image taken December 18, 2004. 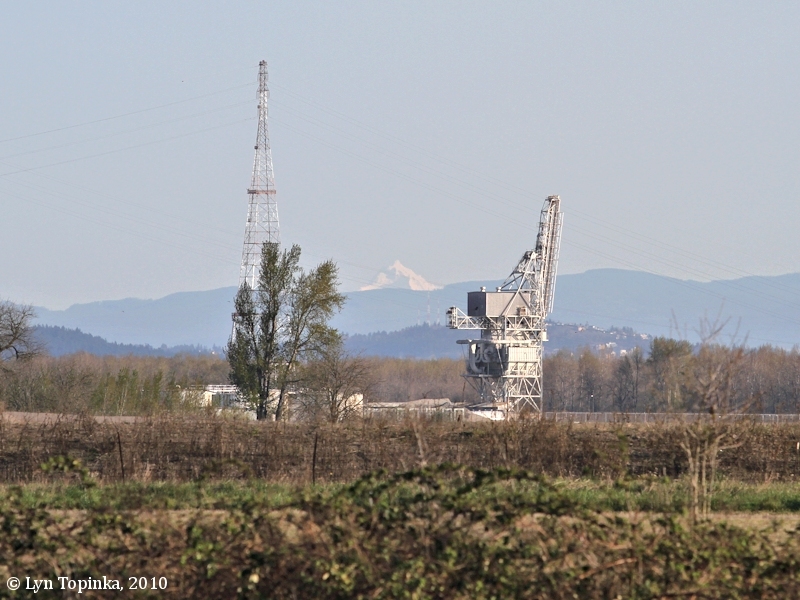 From the mouth of the Willamette River, Lewis and Clark spotted five volcanoes. Mount Jefferson, Mount St. Helens, Mount Hood, Mount Rainier, and Mount Adams. 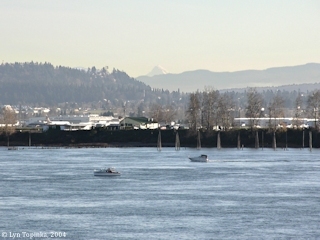 Click image to enlarge Mount Jefferson, Oregon, as seen from Blurock Landing, Washington. Blurock Landing lies across the river from the mouth of the Willamette River. Image taken March 19, 2010. View from the top of Larch Mountain, Oregon. Larch Mountain is visible from many places along the Columbia River. Views of five Cascade Range Volcanoes can be seen from Larch Mountain. Photo by Lyn Topinka, August 3, 2008. Ryan Point is just upstream of Lewis and Clark's campsite of 6 days in March and April 1806. Lewis and Clark spotted and named Mount Jefferson on March 30, 1806. Photo by Lyn Topinka, March 8, 2004. Photo by Lyn Topinka, February 11, 2004. 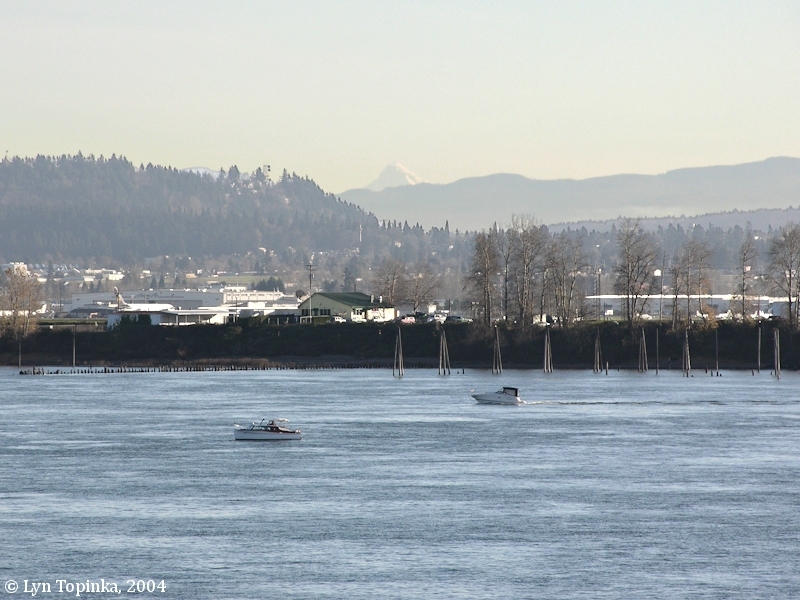 Mount Jefferson, Oregon, as seen from Blurock Landing, Washington. we made 22 Miles only to day the wind and a Strong current being against us all day, with rain. discovered a high mountain S E. Covered with Snow which we call Mt. Jefferson. I provaled on an old indian to mark the Multnomah R [Willamette River] down on the Sand which hid and perfectly Corisponded with the Sketch given me by sundary others, with the addition of a circular mountain which passes this river at the falls and connects with the mountains of the Seacoast. he also lais down the Clark a mos passing a high Conical Mountain near it's mouth on the lower Side and heads in Mount Jefferson [Mount Jefferson, Oregon] which he lais down by raiseing the Sand as a very high mountain and Covered with eternal Snow. the high mountain which this Indian lais down near the enterance of Clark a mos river, we have not Seen as the hills in it's direction from this vally is high and obscures the Sight of it from us. Mt Jefferson we Can plainly See from the enterance of Multnomah [Willamette River] from which place it bears S. E. this is a noble Mountain and I think equally as high or Something higher than Mt. St. Heleans [Mount St. Helens, Washington] but its distance being much greater than that of the latter, So great a portion of it does not appear above the range of mountains which lie between both those Stupendious Mountains and the Mouth of Multnomah [Willamette River]. like Mt. St. Heleans its figure is a regular Cone and is covered with eturnial Snow. that the Clarkamos nation as also those at the falls of the Multnomah [Willamette Falls, at Oregon City, Oregon] live principally on fish of which those Streams abound and also on roots which they precure on it's borders, they also Sometimes Come down to the Columbia in Serch of Wappato. they build their houses in the Same form with those of the Columbian Vally of wide Split boads and Covered with bark of the White Cedar which is the entire length of the one Side of the roof and jut over at the eve about 18 inches. at the distance of about 18 inches transvers Spinters of dried pine is inserted through the Ceder bark inorder to keep it Smooth and prevent it's edge from Colapsing by the heat of the Sun; in this manner the nativs make a very Secure light and lasting roof of this bark. which we have observed in every Vilege in this Vally as well as those above. this Indian also informed me the multnomah above the falls was Crouded with rapids and thickly inhabited by indians of the Cal-lah-po-é-wah Nation. he informed he had himself been a long way up that river &c.